Roman amphitheatres are large, circular or oval open-air venues with raised seating. They were used for events such as gladiator combats, chariot races, venationes (animal slayings) and executions. About 230 Roman amphitheatres have been found across the area of the Roman Empire, however, in the UK only a handful of examples remain to this day. Amphitheatres are distinguished from circuses; from hippodromes, which were usually rectangular and built mainly for racing events; and from stadia, built for athletics. But several of these terms have at times been used for one and the same venue. Isca Augusta (or Isca Silurum) was a Roman legionary fortress and settlement, the remains of which lie beneath parts of the present-day village of Caerleon on the northern outskirts of the city of Newport in South Wales. Because of its rounded form, the unexcavated amphitheatre was known to locals as ‘King Arthur’s Round Table’, but there is no known connection. An initial investigation in 1909 showed the potential for a full-scale excavation of the structure, which began in 1926 and was supervised by Victor Erle Nash-Williams. This revealed, among other things, that the amphitheatre had been built around AD 90, but had twice been partially reconstructed, once in the early part of the 2nd century, and again about a hundred years later. The arena is oval in shape, with eight entrances, and the stadium is thought to have had a capacity of around six thousand spectators. Calleva Atrebatum (or Silchester Roman Town) was an Iron Age oppidum and subsequently a town in the Roman province of Britannia and the civitas capital of the Atrebates tribe. Silchesters amphitheatre was built between AD 50 and 70 at the eastern side of the town and is one of the earliest known amphitheatres in Britain. The amphitheatre has an elliptical plan layout with two entrances on opposing sides and measures in total around 45 x 39 metres. A study of the site has shown that the seating banks were constructed from soil excavated from the main arena area which lies two metres beneath the original ground level. The seating banks could hold between 4500 and 7500 spectators. It was finally abandoned in the 5th to 7th century, which is unusually late compared to other deserted Roman settlements. Moridunum was a Roman fort and town in the Roman province of Britannia. Today it is known as Carmarthen, and is located in the Welsh county of Carmarthenshire (formerly in the county of Dyfed). East of the old town is a Roman amphitheatre, with stone walls and wooden seating, surprisingly large for an amphitheatre for the population living at town. The circumference of the seating area was 92 by 67 meters and the central arena being 46 by 27 meters. Chester Amphitheatre is a Roman amphitheatre in Chester, Cheshire. The ruins currently visible are those of a large stone amphitheatre, similar to those found in Continental Europe, and although it was long believed that a smaller wooden amphitheatre existed on the site beforehand, excavations since 1999 have shown that the wooden grillage is the base of the seating. Today, only the northern half of the structure is exposed; the southern half is covered by buildings, some of which are themselves listed. In use through much of the Roman occupation of Britain, the amphitheatre fell into disuse around the year 350. The amphitheatre was only rediscovered in 1929, when one of the pit walls was discovered during construction work. Between 2000 and 2006, excavation of the amphitheatre took place for Chester City Council and, after 2004, English Heritage. Maumbury Rings is a Neolithic henge in the south of Dorchester town in Dorset, England. It is a large circular earthwork, 85 metres in diameter, with a single bank and internal ditch and an entrance to the north east. The ditch was created by digging a series of funnel-shaped shafts, each 10 metres deep, which were so closely positioned as to create a continuous trench. Human and deer skull fragments were found in the ditch fill when it was excavated in the early 20th century. Two thousand five hundred years after construction, during the Roman occupation (about 100AD), the site was adapted as an amphitheatre for the use of the citizens of the nearby Roman town of Durnovaria (Dorchester). The entrance was retained and an inner enclosure built in the south west interpreted as being for the use of the performers. The inside of the henge was lowered, with the material produced piled onto the banks. Cirencester Amphitheatre was a Roman amphitheatre located in Cirencester, Gloucestershire, England. Archeological digs have uncovered the earthworks, revealing the outline of the construction, which is still visible, with the banking reaching 25 feet from the bottom of the arena. The arena itself is approximately 150 feet (46 m) by 135 feet (41 m). Roman artefacts including coins and pottery have been discovered on the site. It is estimated that it was constructed towards the beginning of the 2nd century. The earthworks show evidence of tiered wooden seats for around 8000 people, placed upon terraces made of stone.There are two entrances, located at the North-Eastern and South-Western ends of the stadium. During the 5th century, when the Western Roman Empire was under attack and soldiers returned to Rome to defend it, the amphitheatre was fortified to defend against the invading Saxons. Wooden structures were erected within the arena itself, placed in postholes, and a portion of the North-Eastern entrance was blocked. 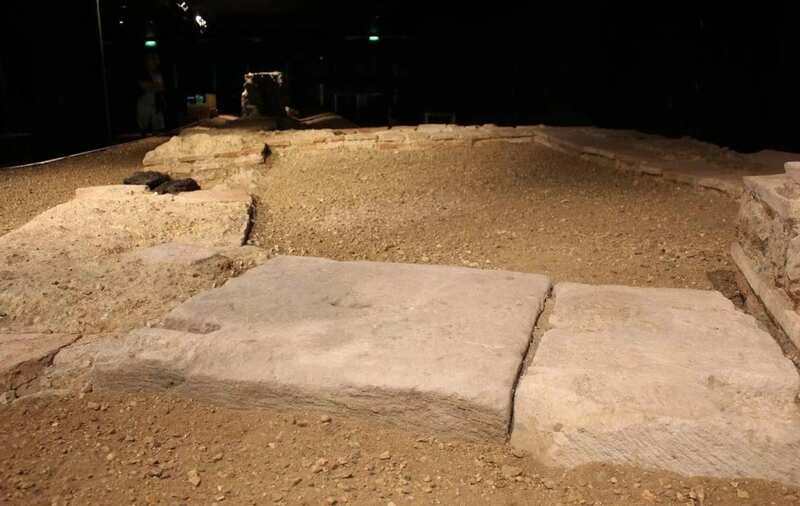 The Roman amphitheatre of Londinium is situated in a vaulted chamber beneath the Guildhall gallery complex. Discovered in 1998 during a planned expansion of the Guildhall, the remains are displayed in situ and are now a protected monument. 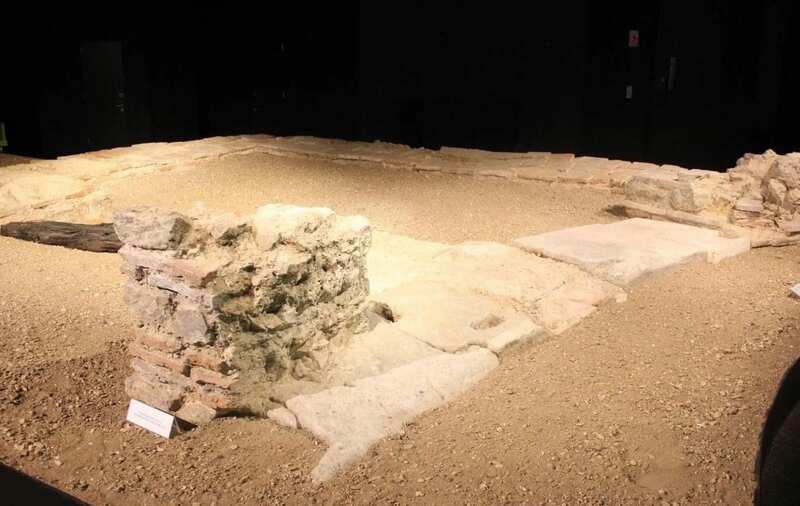 London’s first Roman amphitheatre was built in AD70, constructed of wood, but was later renovated during the 2nd century with rag-stone walls and a tiled entrance. Able to hold thousands of spectators, the size of the amphitheater is displayed on street level, where the circumference of the arena is marked with a black circle on the paving of the courtyard in front of the hall. The amphitheatre was used for various events, including gladiatorial games, animal fighting, executions and religious festivities. When the Roman province of Britannia looked to its own defences, the amphitheatre became derelict along with the remainder of the Roman city and turned to ruin.Further Excavations by MOLAS in 2000 at the entrance to Guildhall Yard exposed remains of a great 13th-century gatehouse built directly over the southern entrance to the amphitheatre. Although not actually an amphitheatre, the Roman Theatre of Verulanium is certainly of worthy note. Unique in Britain, it survives as one of the only known examples of a roman theatre from Roman Britannia and is one of the most impressive roman ruins in England. The theatre was built around 140AD, with a raised wooden platform for religious processions, dancing, wrestling and wild beast shows. In its prime, the theatre could seat almost 2000 spectators but was abandoned when occupation by the Romans ended between 400 and 450. Rutupiae or Portus Ritupis was founded by the Romans after their invasion of Britain in ad 43. Because of its position near the mouth of the Stour, Rutupiae was the major British port under the Romans and the starting point for their equivalent of Watling Street. The amphitheatre survives as an elliptical hollow, about 60 metres by 50 metres, measuring 3 metres deep. The hollow is surrounded by a bank 12 metres wide and up to 2 metres high. Excavations in 1849 uncovered three entrances and it appeared to date from the late 3rd century AD and have been occupied until the early 5th century AD. Noviomagus Reginorum was the Roman town which is today called Chichester, situated in the modern English county of West Sussex. The town became an important residential, market and industrial centre, producing both fine tableware and enamelwork. In the 2nd century the town was surrounded by a bank and timber palisade which was later rebuilt in stone. An amphitheatre was built outside the city walls, close to the East Gate, in around 80 AD. The area is now a park, but the site of the amphitheatre is discernible as a gentle bank approximately oval in shape; a notice board in the park gives more information.